Grandmother Walking Thunder has dedicated her life to healing in the traditional ways of the Dine’ Medicine People. She truly walks in “The Beauty Way,” and is known as a powerful healer, an accomplished sandpainter, and an inspirational teacher. 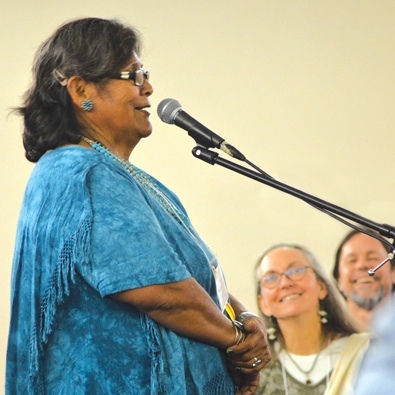 We are honored that Grandmother Walking Thunder is willing to model for us her immense connection to Mother Earth and all the elements, and to share in the wonder of her prayers, songs and healing arts. She is a powerful healer, an accomplished sand painter, and an inspirational teacher who truly models her immense connection to Mother Earth. With a deep knowledge of plant medicine, sand painting traditions, prayer and ceremony, she has studied with her elders since childhood and has dedicated her life to healing in the traditional ways of the Dine’ Medicine People. She truly walks in “ The Beauty Way” carrying the wisdom of the ancient tradition to bring this forth for helping us to “ remember”.